This lecture is organized around three themes: art as an expression of religious identity, art as an expression of social standing, and the difference between style and subject matter. Another important point to clarify is the name of this section—students often think that “Jewish” and “Early Christian” apply to style, when it really applies to the subject matter. There is no difference in the way that Christian or Jewish or pagan pictures are painted. It is important to emphasize throughout the lecture that in terms of style, Jewish, Christian, pagan—even Zoroastrian art—is simply late Roman or late antique. Depending on the background of your students, you may find that many of them lack basic knowledge or have misconceptions of both Judaism and Christianity. If you are not sure if the students are familiar with the basic concepts, you may start the lecture by asking simple questions and providing basic background information. The Roman Empire was extraordinarily diverse with respect to social, ethnic, racial, linguistic, and religious backgrounds. During the second and third centuries, many Romans started to reject polytheism in favor of monotheistic religions and cults. Ask your students if they know what monotheism and polytheism mean. Emphasize that Judaism and Christianity are both monotheist, meaning a belief in one creator of the universe who hears prayers and rules. Jews believe that God made covenant with them and that they are the chosen people awaiting the coming of the Messiah (anointed one). Christians believe that Jesus Christ was the Messiah. You may add that, together with Islam, all three are “religions of the book,” which means that all of them have written records of God’s words in form of the Torah, Bible, and Quran. Mention that the Torah consists of the first five books of the Hebrew Bible and is the same as the first five books of the Old Testament in the Christian Bible. Many students will think that the first Christian artworks appeared in the time of Christ, however, Christianity grew slowly after his death from a small base in Palestine. Only after periods of toleration and persecution did it finally become legalized in the Roman Empire through Emperor Constantine’s Edict of Milan in 313 CE, which assured freedom of worship and restored confiscated church property. Because of Christianity’s illegal status, most Christians likely worshiped in private, and so no distinguishable Christian buildings survive from the pre-313 CE period, and no artworks survive prior to the third century. Sarcophagus of Junius Bassus, c. 359. 4’ × 8’, Grottoes of Saint Peter, Vatican City, marble. I would recommend starting with a Yale exhibition catalog by Jeffrey Spier, Picturing the Bible: The Earliest Christian Art (New Haven; Fort Worth: Yale University Press; In Association with the Kimbell Art Museum, 2007). It contains wonderful illustrations of many objects as well as five approachable, short essays on the most important topics. Peter Brown’s The World of Late Antiquity: AD 150–750 (New York: Norton & Company, 1989) is one of the best sources to consider the social, political, and economic transformations during the period. A good source for the early Christian architecture, although, by now a little outdated in terms of archeological findings, is Richard Krautheimer’s Early Christian and Byzantine Architecture (New Haven: Yale University Press, 1986). For Jewish architecture, I recommend Steven Fine’s Sacred Realm: the Emergence of the Synagogue in the Ancient World, (New York: Yeshiva University Museum, 1996). For more specific topics, I suggest reading an article on the Dura Europos synagogue by Karen Stern, “Mapping Devotion in Roman Dura Europos: A Reconsideration of the Synagogue Ceiling,” American Journal of Archaeology 114:3 (July 2010), 473–504, and/or an article on style in late antiquity by Jas Elsner, “Archaeologies and Agendas: Reflections on Late Ancient Jewish Art and Early Christian Art,” The Journal of Roman Studies 93 (2003): 114–28. Start the lecture with the earliest Christian art, followed by funerary art (catacombs and sarcophagi), and finish with Christian and Jewish architecture and wall paintings. I would advise against discussing Jewish and Christian art separately, since chronologically they develop at the same time during the late antique/late Roman culture. This way, you can highlight the use of the common stylistic tropes and emphasize the differences in subject matter. Images: This set is probably more than you may be able to cover in a single lecture. If you can devote two lectures to this period that would be great. If not, I encourage you to limit your class to the images and themes that will best complement your other lectures. Fish and anchor epitaph, the Catacombs of Domitilla, Rome. No certifiably “Christian” art works are datable prior to the third century. Some of the symbols and simple images found could have been Christian, but no evidence exists to confirm these assumptions. The earliest confirmed Christian artworks date to the third century and consist of simple symbols, such as a fish or an anchor. Most would traditionally associate Christianity with the symbol of the cross, but this image was very rare, and the first artwork with a cross does not appear until 420 CE—much later than the other symbols. Why? Death on the cross was given only to the worst and most wretched perpetrators. If a Christian wanted to encourage another to convert, he or she had to emphasize the glory and power of God and this “scandal of the cross” would not encourage conversion. It was more important to emphasize God’s miracles and power to protect His people. The anchor and the fish are such symbols. An anchor symbolizes a safe arrival to one’s destination (an important message when travel and work on the sea was widespread but also very dangerous). Metaphorically, it symbolized the safe arrival to heaven after one’s death. Fish in Ancient Greek means IXTUC (Ichtus), which is an acronym for Jesus Christ, Son of God, Savior. In this way the fish symbolizes Jesus, and, by drawing this symbol, one could identify oneself as His devotee. Moreover, fish are also associated with the biblical story of the proliferation of bread and fish (“Feeding of 5000” known from all four canonical Gospels: Matthew 14:13–21, Mark 6:31–44, Luke 9:10–17 and John 6:5–15). This shows that the Bible becomes the primary source of pictorial decoration for the early Christians. During the pre-313 CE period, when Christianity was still illegal in the Roman Empire, these symbols were safe marks that allowed Christians to recognize each other and avoid persecution. Pagans would not be familiar with the metaphorical meaning of these symbols as they were based on the Bible which they did not read. Catacomb of St. Peter and Marcellinus, Rome. The richest source of early Christian art are the catacombs in Rome. The catacombs are an intricate network of galleries and burial chambers cut out from tufa (soft volcanic rock in the area of Rome and Tuscany) beneath the city level. Jews, Christians, and pagans al buried the bodies of their dead in these corridors and chambers. Even though they were used to bury illegally practicing Christians, these catacombs survived and were not banned or destroyed, since Romans viewed the tombs as sacred. In addition, the cemeteries were legally registered and protected by Roman law even during the periods of severe persecution. Everyone was buried together, without regard for one’s denomination. Later, in the late third and fourth centuries, Christian and Jewish tombs became separate. There were two basic options of burial in the catacombs, depending on the amount of money one was willing to spend. The cheapest option was a burial in niches called loculi. Loculi were just simple openings in walls of long excavated corridors, enclosed by slabs or tiles, and sometimes plastered over. They varied in size from one to four or more bodies. The more expensive option was a cubiculum (entirely separate room in the galleries) that could be bought out to house one’s entire family. Cubicula could be covered with wall paintings according to the will of the owner. The Good Shepherd ceiling decoration from the catacomb of St. Peter and Marcellinus, is such an example. In this painting, note the framing device of circles, lunettes, and lines, into which are inscribed small figures and narrative scenes. This type of structuring of the pictorial field is a type of decoration commonly found in contemporary private homes, for example in Pompeii and Ostia. Moreover, the way that the figures are painted, frontal, with only simple highlights in the draperies and emphasis on gestures, is typical for late Roman art–again, no distinctive Christian style exists at this point (but the subject matter is Christian). The overall message of the images is optimistic and focused on salvation. An image of the Good Shepherd is in the central circle, which was one of the most popular subjects of early Christian art. The image of a shepherd in itself, however, is not particularly Christian. In fact, it has a long Graeco-Roman heritage: bucolic scenes of shepherds tending their sheep were a popular wall decoration in Roman houses and subjects for archaic Greek sculptures. Yet, for Christians, the image of the shepherd had a metaphorical meaning. In other words, the image in itself is not a Christian invention but was reinterpreted in biblical terms. In Psalm 22, God is described as a shepherd and in the New Testament, Christ calls himself a shepherd as well. The image serves as a reference to a textual source (the Bible) and a metaphor for the meaning that lies beyond what is simply shown in the pictorial plane. The lunettes on the sides of the Good Shepherd show the key episodes from the Old Testament story of Jonah and the Whale in a clockwise direction. Jonah was thrown from the ship (on the left), swallowed by a whale and sitting in his belly (largely missing now), emerging from the whale on the third day (right), safe on the ground resting under a gourd, and contemplating salvation (bottom). This was a popular theme taken by Christians from the Hebrew Bible (Old Testament). It is appropriate for this funerary context since Jonah, metaphorically dead in the whale’s belly, is resurrected by the Grace of God to live, inspiring Christians to await a similar optimistic end to their lives. Moreover, Jonah is also seen here as prefiguration, reflecting the death and resurrection of Christ. Comparisons between the Old Testament and New Testament are a very common way of reading scriptures. Early theologians would look for the events from the Old Testament that “prefigured” the coming of Christ or characters that were a “type” of Christ. In this catacomb painting, we can see that typology (searching for types of Christ) was not exclusive to textual interpretation, but also occurred in art. Such typological viewing is a uniquely Christian way of interpreting images, a comparative method not found in pagan or Jewish art. In this way, early Christian art is Roman in style but Christian in subject matter. 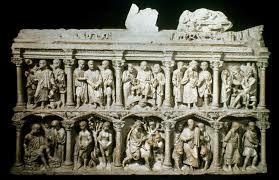 The Sarcophagus of Junius Bassus represents another type of funerary art from the early Christian period. A sarcophagus is a large stone or marble “coffin” used to house the body of the deceased. In contrast to common belief, Christians were not the instigators of preserving the body. Already in times of Emperors Hadrian and Trajan (early second century AD), Romans rejected cremation in favor of inhumation. The wealthiest of Christians, largely patricians but also wealthy freedmen, imitated their pagan counterparts in ordering sarcophagi, which were much more expensive than a loculus or even cubiculum in the catacombs. Sarcophagi could be placed either in the fancy arched niches (arcosolia) in the cubicula of the catacombs or in specially built mausolea (above-ground funerary structures meant specifically to house the bodies of the deceased). This particular sarcophagus belonged to Junius Bassus, a patrician and prefect of the city of Rome, son of a consul, who was baptized as a Christian only on his deathbed. At this point, Christianity is legalized but is still largely the religion of those with lower social standing. * The great majority of the Roman senate and the most powerful families of Rome are still pagan. Bassus was probably one of the first patricians to convert, but openly expressing his beliefs would have probably hindered his career (and family relations—his father was a consul and a well-known donor of pagan art). This is probably why Bassus chose to be baptized only on his deathbed at which point he could also blatantly display his Christian beliefs in his sarcophagus. The sarcophagus is decorated with a selection of scenes from the Old and New Testaments, set in individual niches in two tiers. From top left to bottom right the scenes are: Sacrifice of Isaac, Arrest of Peter, Christ Enthroned between Peter and Paul, and a double scene of the Trial of Jesus before Pilate, (washing his hands in the last niche), followed by Job and the Dunghill, Adam and Eve, Christ’s Entry into Jerusalem, Daniel in the Lion’s Den, and the Arrest of Paul. The viewer is meant to contemplate the mix of stories from both Old and New Testament and search for typological connections between them. For example, Adam, in the Adam and Eve niche, caused the fall of humanity. In contrast, Christ (in the Trial of Jesus) can be seen as the new Adam—one who sacrifices himself in order to redeem humanity. Significantly, some of the poses we encounter in the sarcophagus’s scenes are derived from Roman visual symbols. For example, Christ Enthroned (in the top center) is modeled on the Roman adlocutio (Roman emperor addressing the people—see the comparison with the scene on the Arch of Constantine), while Christ’s Entry to Jerusalem is inspired by the imperial theme of adventus (Roman emperor’s formal arrival to the city and his welcome; see the panel with Marcus Aurelius for comparison). The use of the aristocratic or imperial Roman visual vocabulary is appropriate here for two reasons. First of all, Bassus, who had close ties to senate, emphasizes this connection and therefore his social standing. Second, this is already a post-313 CE artwork, when the emperors ruling in Constantinople are Christian (to the regret of conservative pagan aristocracy in Rome). Therefore, it is appropriate to model Christ on the Roman emperor since now the Emperor is Christian. Such comparison would be hugely offensive in the pre-313 years, when Christianity was illegal or actively combated. This is why, in the catacombs and other pre-313 CE artworks Christ is shown as a poor shepherd at the periphery of the empire–just like many of his adherents at that time. Note on style: the figures are sculpted in a typically late antique style: more simplified, blocky, but still very much modeled on the nudes of antiquity. For example you can compare Adam and Eve with the reliefs from column of Trajan or the Hadrianic roundels from the Arch of Constantine. Sarcophagus of Constantina represents yet another type of early Christian funerary art, one fit for the imperial family. This sarcophagus was placed in the center of a large round mausoleum built for Constantina, daughter of Emperor Constantine and a devout Christian. The sarcophagus is massive in size: 128 cm high, 233 cm long, and 157 wide, carved entirely out of porphyry (exceptionally hard and difficult stone to work, mined only in Mt. Sinai in Egypt). Since the time of Augustus, the use of porphyry and the color purple was reserved by law only for the imperial family. By choosing the purple stone Constantina’s sarcophagus is very much tied to the Roman imperial tradition. What about the subject matter? The sarcophagus, in fact, shows no conspicuous Christian message and is decorated with scenes of winged putti harvesting grapes to make wines, framed by acanthus scrolls. This type of imagery was a common decorative trope already in Pompeian houses and could easily be interpreted within the Greco-Roman tradition as Bacchus and the harvest. Christians, however, could associate both the purple color and grape-harvesting with the wine of the Eucharist, as well as Christ himself (who called himself a true vine in John 15:1). Similarly the peacocks could be seen as symbols of eternal life in paradise or sheep as members of the Christian flock, again based on biblical references. Such Christian interpretation, however, would require knowledge of the scripture and therefore would not be available to an average pagan viewer. In fact, if we did not know who the patron was, her religious identity would be questionable. But, this ambiguity significantly indicates that Constantina’s royal identity took precedence, at least in the public realm, over her Christian identity. Positioning herself in the Roman imperial lineage, she made more conservative choices than Junius Bassus. Again, the Roman aristocracy was only slowly converting in the mid-fourth century—most were still pagan and Constantine’s conversion would already be a big shock. Only one “church,” a meeting place for Christians celebrating the Eucharist, survives from the period before Christianity’s legalization (pre-313 CE). The building was discovered in a Roman military and trading town called Dura Europos (modern day Syria), situated on the peripheries of the empire and on the borderline with Sasanian Persia. In 256 CE, the town was attacked by Persians, captured and soon abandoned. In preparation of the attack, inhabitants hastily filled the defense-walls with gravel and sand. This action preserved the majority of wall paintings and décor of the various buildings until the town’s rediscovery in 1920s and 1930s. The excavators who conducted the study were amazed to find such a vibrant and varied array of religious paintings in Jewish, Christian, and pagan temples. One of such exceptional findings was a regular Roman style house along the defense wall. Due to its interior décor, it has been identified as one of the earliest discovered churches to date. The building was small and looked pretty much like a typical house since Christianity was illegal at the time. If Dura had survived after 313 this meager building would have been replaced with a much more impressive structure. The best-preserved part of the complex is the baptistery room (a place with a font used for baptism). The paintings covering its walls are rather crude compared to the ones in the neighboring pagan temple and a synagogue. This suggests that Dura’s Christian community was probably poorer and, therefore, unable to afford more skilled artisans. Yet, in terms of style, the murals take on the typical late Roman/late antique aesthetic with an emphasis on gesture, frontality, outlined silhouettes, and bold simple colors. The wall paintings on the sides focus on the life of Christ and his miraculous events (Christ and Peter walking on water, Christ healing paralytic, Maries visiting tomb of Christ), all of which send a positive message for converts. Note, however, that all viewers had to be familiar with the Scriptures in order to interpret the scenes. The most interesting, but worst preserved painting appears in the arch above the baptismal font. It shows an image of the good shepherd carrying a sheep on his shoulders surrounded by his flock—which reinforces the borrowed symbolism discussed earlier. Below the Good Shepherd, one can barely notice a tree flanked by two silhouetted figures that represent Adam and Eve. Paired with the good shepherd, it is the earliest instance of typology used in visual art. This is especially significant since this is a poor community far from large cities—showing the breadth of this imagery across long distances. Even more surprising, however, was the discovery of a synagogue in the same town. Synagogue (from Greek meaning to gather together) was a place of assembly for Jews and not a house of God (the House of God was the Temple of Solomon in Jerusalem). The Dura Synagogue was situated nearby along the same defense wall as the Christian building, but was much more elaborate and grand, indicating that the Jewish community was larger and wealthier than the Christian one (also Judaism was legal, so they could afford more prominence). Shocking the archaeologists who excavated the synagogue, its main room used for housing of the Torah (first 5 books of the Hebrew Scriptures) was entirely covered with images. Until then, scholars thought that Jewish culture was aniconic (does not accept images in agreement with one of Mosaic Commandments). Here, however, very skillfully executed frescoes were arranged on the walls in three bands of fifty-eight individual scenes. They portray a variety of themes such as narratives of Jewish heroes (Crossing of the Red Sea, Drowning of the Pharaoh) and scenes of liturgical significance (Menorah in the Temple of Solomon, Temple of Aaron). All images are based on the Hebrew Bible and drawn from books of Genesis, Exodus, Samuel, Kings, Esther, and Ezekiel. The Dura images are the earliest discovered Jewish paintings to date. Moses at the Well Giving Water to 12 Tribes of Israel is an example of a narrative scene that is meant to show God’s protection of the chosen people. Similar to the images in the baptistery the message is positive and encourages devotion. The paintings of single figures with upraised arms represent each tribe are also late Roman/late antique in terms of style: the figures are frontal, hieratic in scale, and rather flat. Devoid of action, the viewer focuses on the message, which they can identify with ease. Importantly, the creator uses both Jewish and Roman pictorial traditions. For example, a Corinthian portico frames a menorah and Moses is shown as a combination of an Old Testament patriarch (bearded, traditionally associated with Jewish men) and a Roman patrician (only Roman aristocracy could wear a toga). This indicates that the Duran Jewish community was well acquainted with the Roman cultural traditions and saw them as fitting to represent both the menorah and Moses. In addition, this period was a time of serious religious competition. In this small peripheral town, there are more than ten religious communities to choose from! It was important to proclaim the community’s identity, its history, and the power of the deity in order to keep members from leaving and potentially attract new ones. These beautiful images with their positive messages were part of this effort. More specifically, the Christian images come from the Old Testament, linking the relatively new religion to the more established religion of Judaism. The synagogue is decorated profusely with figural imagery in order to express the Jewish identity and keep the community’s members from converting to other religions. After Christianity’s legalization, the fourth and fifth centuries were the formative period of church architecture. This early experimentation resulted in adoption of the basilica plan, a design derived from secular Roman examples that has still influences Christian architecture until this day. The Church of Santa Sabina is the quintessential example of the mature basilica type. Standard basilica design includes three clearly basic units: a nave, two aisles, and an apse that were useful for Christian purposes. The nave and aisles could be easily extended longitudinally as well as laterally to accommodate the growing community. The focal placement of the apse (originally a place for the statue of the Roman emperor) helped to direct attention to the most important part of the church, where the Eucharist was performed. 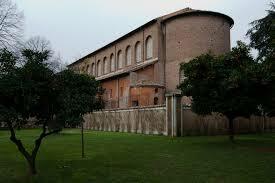 In addition, the basilica type was devoid of references to pagan cults since it was a secular building. This made it particularly fitting for the adoption by Christianity. Unlike Roman or Greek temples, Christian churches were plain on the outside (typically a brick exterior) and represented a spiritual heavily space on the inside, covered with colorful marble, sparkling mosaics of precious stones, glass, and gold. The Christian church uses columns to support its interior, and are typically made from spolia (reused materials) sourced from abandoned pagan temples. In these churches, Christians introduced brick arches instead of horizontal architraves (solid piers of square form). Although the use of arches can be seen in Diocletian’s palace in Split, Christian architecture popularized the practice and turned it into a fundamental characteristic of ecclesiastical constructions. In sum, while the design of Santa Sabina was inspired by Roman architecture, the early Christians did not merely copy it, but consciously adapted and altered it according to their needs. Like Christians, Jews also built places of worship based on the model of Roman basilica. Beth Alpha Synagogue is a typical Jewish temple from the region of greater Syro-Palestine. Using the basilica plan, this synagogue had a central nave with an apse to display the Torah, aisles on both sides, and a line of columns. The orientation of the building mattered as the apse with the Torah shrine had to be directed towards Jerusalem (Christian churches’ apse were directed to the East). Unfortunately, Beth Alpha synagogue, like the majority of Jewish and Christian houses of worship, suffered during the centuries of Islamic rule in the region. As of now, only the outline of the walls and the floor were preserved, covered by sand. The mosaic floor, however, is one of the most outstanding examples of late antique Jewish art. Most of its design is geometric, but three main panels in the nave are filled with figures, symbols, and narrative scenes. The floor is divided into three registers. The topmost, and closest to the Torah shrine, is the metaphysical realm that depicts symbols appropriate to be in the vicinity of the Torah shrine. It shows a Torah shrine and a variety of ritual objects such as a lulav (a palm frond) and a shofar (a ram’s horn) protected by growling lions. The celestial realm in the middle of the floor depicts the Graeco-Roman deity Helios (sun-god) surrounded by a palette of zodiac signs that imply perpetual continuity and the cyclical changing of the seasons (whose personifications are depicted in the four corners). The presence of late Roman deities and a zodiac indicate that this community was comfortable with Roman culture. In fact, the names of the two artists (Marianos and Hanina) and date are inscribed in both Aramaic and Greek, indicating that some of the members of the synagogue could not read Aramaic, which was the main language of the local Jewish population. The community of Beth Alpha seems to exemplify the more “relaxed” Judaism, which allowed Graeco-Roman motifs and figurative imagery over purely geometric motifs. Another synagogue discovered nearby belonged probably to what we may call “conservative” or “orthodox” community, since its mosaic floor is covered exclusively with geometric designs. The third register depicts a terrestrial realm showing the Biblical story of Abraham Sacrificing Isaac. This example further shows that Jews, Christians, and pagans shared the late antique style that emphasized ease of image-comprehension. The animals are shown in profile, humans are frontal, exaggerated gestures are the focus of the action, and figures are flat (outlined silhouettes filled with single color). Is the placement of the Torah on the floor sacrilegious? The Torah allowed images as long as they were not worshipped. Through the placement on the floor, this Jewish community demonstrated that they were not worshipping the image itself (idolatry). In this aspect, the Jews differed from Christians, who actually banned representations of crosses on the floors so that they were not treaded upon. In sum, Beth Alpha synagogue shows imagery and architecture strongly rooted in both Hellenic and Christian symbolism—indicating cultural sophistication and assimilation of the Syro-Palestinian Jews in late antiquity. *I encourage you to use the term “social standing” and not “class” in the second theme. This is important, since Marx used this term to describe the structure of the twentieth-century society while the late antique society was structured in a different way. For example, being a Roman slave does not translate easily into a working class individual (the spectrum of slave’s well-being varied tremendously: in addition to the common view of impoverished, abused individual, which was certainly true for many, some slaves were even wealthier than their masters, many were quite independent), also patricians are not equivalent to the upper class. Church of Santa Sabina, Rome, c. 422–432. If you are confused about anything, please explain what puzzled you. Alternatively, ask your students to summarize the main points of the lecture (pay attention if they discuss issues such art and religious identity, art and social standing, and style vs subject matter). Can you identify the religious identity of the commissioner of this piece? If so, what elements disclose this identity? Can you identify the social standing of the commissioner? Was it a wealthy person, someone holding a high position, or a simple devotee? How do we know? What different artistic choices are made based on one’s position within the society? After today’s discussion do you think it is valid to use the terms Jewish and Early Christian art to describe style? What can we say about the style of these artworks? In turn, what can we say about the subject matter? What are the best labels to use when describing style vs subject matter?